"9 TO 5 is as delightful and jolly as one can get in a comedy that has something to say but consciously shirks any trace of indoctrination." 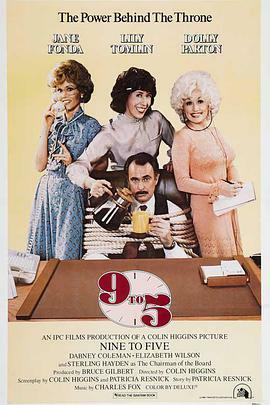 Three female company employees wage war against their“sexist, egotistical, lying, hypocritical bigot” boss in this prototype 80s sisterhood comedy, 9 TO 5 is the late Colin Higgins’ second feature film andflexes the muscle of female star power which not only brings down the house, but also sets alight its box office, the runner-up top-grosser of its year, second only to STAR WARS: THE EMPIRE STRIKES BACK. The Fonda-Tomlin-Parton trinity embodies three different types of career women, Fonda’s Judy is a housewife grossly jilted by her ex-husband for his secretary, so she is the greenhorn in the workplace, prissy but not without wits and guts, her frilly entrance is remarkably incongruous with the rest, although her clash with the boss Frank (Coleman) is most tangential among the three, her personal victory climaxed when she blurts out to her feckless ex-husband that being dumped by him is the best thing ever happened to her. Tomlin’s Violet is a widow with a brood of four,the assertive senior office supervisor who has plodded for years in the company, yet the promotion she deserves proves to be unattainable because of Frank's sexism, and aggravated by being ordered about like a servant by him, she has every reason to get back at him; Parton’s Doralee (her maiden picture, who also pens and belts out the Oscar-nominated title song), a corn-fed, bosomy secretary repulses the derogated stereotype as a boss-hunting schemer, who is indeed happily married and only humors Frank’s advancement for the sake of the job, but in the face of Frank blabbering blackmail, she is the one who is not hesitant to pinion him like a steer. Truly, the triad enjoys a real blast together, initiated by a joint-influenced brainstorm about how each envisions a scenario to vent their grievance on Frank - here Higgins makes a good fist of genre conventions, whether it is a black-white mob thriller, a lasso-tossing oater or a Snow White animation with a dark spin, all are given a reality simulacrum later in the plot - and hits the mark during their hilarious blunder with the wrong body, although the resultant kidnapping idea is less wholly engaging for its yawning implausibility, not least when the deus ex machina comes about in the form of Sterling Hayden’s chairman of the board, publicly asks equal pay to be eliminated from the reform program, which is actually conceived by the triad and executed by forging Hank’s signature. Nonetheless, 9 TO 5 is as delightful and jolly as one can get in a comedy that has something to say but consciously avoids any trace of indoctrination, all three leading ladies are having a field day, but for my liking Tomlin is the one gets an upper hand for her steely nerve and comedic timing; as the antagonist, a versatile Coleman eloquently exhibits shameless wickedness to the hilt, and lastly, Elizabeth Wilson has her own moment as a brilliant tittle-tattler, who perfectly encapsulates the entire farce with a precisely uttered“Holy merde!” to bring down the curtain in the coda. referential entries: Higgins’ FOUL PLAY (1978, 5.4/10); Seth Gordon's HORRIBLE BOSSES (2011, 5.3/10).